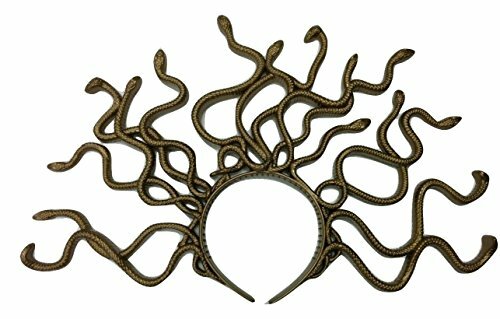 Medusa is a staple in Greek mythology, many learn about her as a kid which is probably not the best idea because she looks scary! Known for having a head of serpent hair that can turn anyone that looks at her into stone. While this may not the best person to see in a dark alley at Halloween she’ll make the perfect choice. Create your own Medusa Halloween costume and scare everyone in your neighbourhood this year regardless of their age. As well as her serpent hair she is described as being an ugly hideous woman who was the daughter of Ceto and Phorcys. It’s no surprise that even after her death she was used as a weapon as her stone-turning powers remained, once beheaded she was kept by Perseus who then gave her head as a gift to the goddess Athena who embedded it in her shield for protection. Now there are tons of brilliant options to choose from although most are under generic names like ‘Serpent Goddess’ or ‘Mythical Goddess’ but they all achieve the same thing. Here is the first option which is the most popular on Amazon and elsewhere at the time of writing with a majority of positive reviews too. As I stated above it doesn’t include ‘Medusa’ in its title but as you can see still does the trick. It comes with dress, headpiece and cuff. All you need to add is your own footwear, do your hair appropriately and possibly wear a shirt underneath for added warmth and/or comfort. 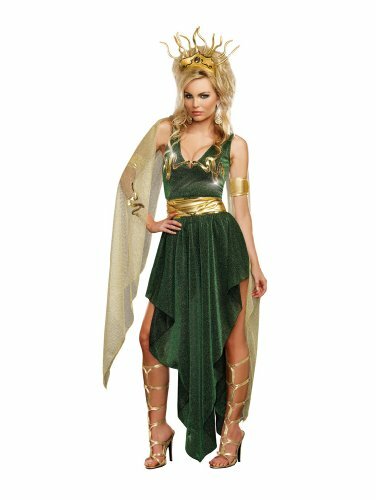 I think for this specific outfit a red wig similar to the reference image would work well and contrast with the green tones. For outfits that do not come with a headband or where you want to make one yourself this is a really simple look to accomplish. Start with a regular headband, maybe one you don’t use anymore if not dollar stores normally stock them and it doesn’t matter if you ruin it aswell. Also at the dollar store normally around Halloween you’ll be able to find plastic snakes, of course real snakes aren’t an option. Paint your headband over in green paint (if it’s another color) and add the snakes on with wire. Add another layer of paint to polish everything off. Otherwise there is always a premade option that will save you heaps of time and hassle. This is by far the most extravagant one I’ve seen which is a whole headpiece rather than a simple headband that would look similar to the dollar store solution I suggested above. Medusa’s hair can come in many different forms and colors depending on the image you find of her, in this case I suggest either green to match your serpents or red to contrast them. Natural hair is totally fine too although you’ll have to keep it out and flowing like a goddess would, optionally add in red spray dye for an added pop of color. 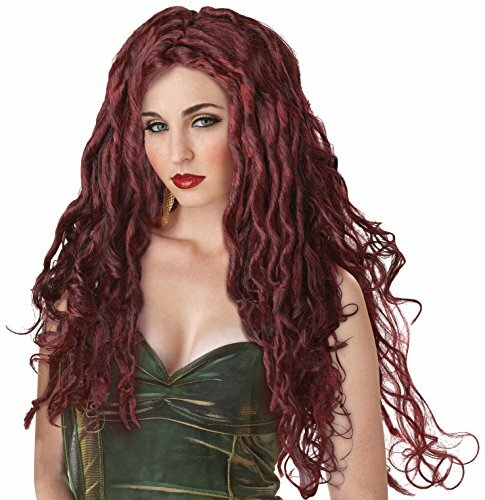 Here is a red wig to use with the above costume that will give you a look only a goddess could achieve. Made out of synthetic fibres that almost look like snakes themselves. Finally you can create this outfit completely from scratch too, nothing needs to be sewed so it’s simply a matter of putting together the different items. Makeup can work to pull the whole thing together although it’s not essential. Nevertheless I like how she applies certain tones through fabric netting to achieve a unique scaly textured look.